It has recently been reported that former President Gerald R. Ford has died at his California home. At 93, he was the longest-living former president. Although not a Grand Rapids native, he spent much of his childhood here. 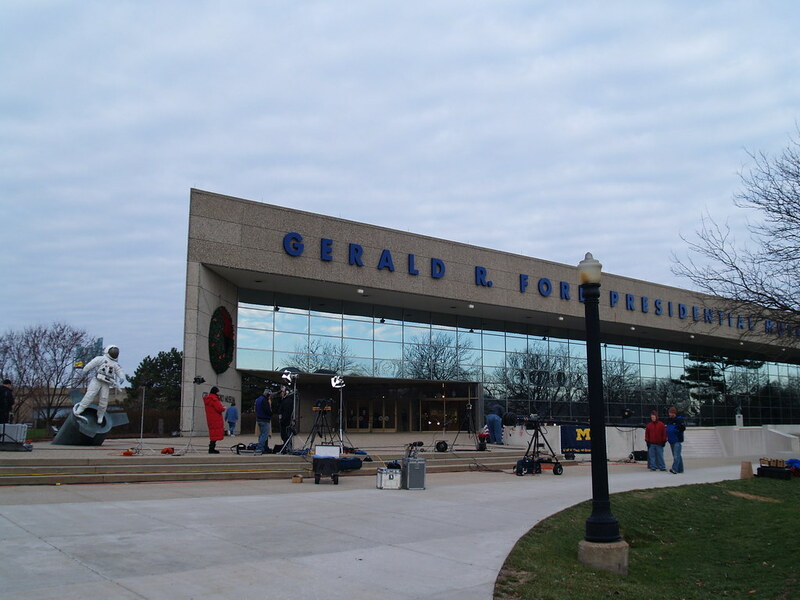 The International Airport bears his name and the Gerald R. Ford Presidential Museum is located in downtown Grand Rapids. It was planned that upon his death he would be buried in Grand Rapids on the museum grounds. If this is still the case, what does Grand Rapids have to do to prepare? 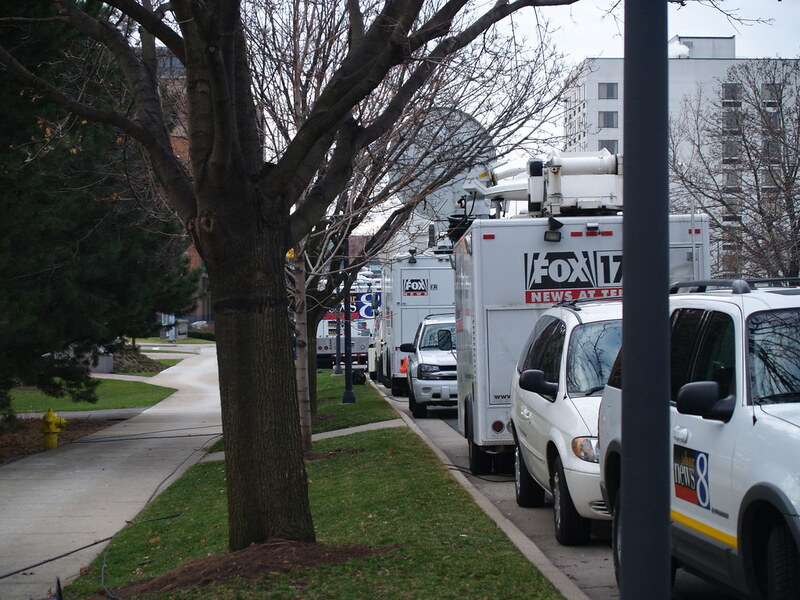 Will the city do a quick clean-up before all the cameras come to town? Will downtown be able to accomodate the strain? This is a sad day for Grand Rapids. Gerald R. Ford is among the most awesome Presidents ev-VER! A commemoration of his life here. I believe he and his mother moved to GR when he was only a few weeks old. GR was the only home he ever knew growing up. Actually he was one of the most lackluster, of not THE lackluster President of the post World War II USA. He was never elected, and was universally disliked for giving his predecessor, President Nixon, (Watergate). a pardon so he would not be prosecuted for the crimes he committed and didn't accomplish anything for the partial term he was in office. He does have the distinction as being the only un-elected president in office. His failure to win the Presidential election in 1976 marked the end of Eisenhower-Nixon Republicanism to be replaced by the social conservative Reagan-Bush Republicans that has ruled that party until it's collapse in the 2006 mid-term elections. I just went by his childhood home yesterday on Union. Everytime I go by there, I'm a little more hopeful, as a President lived there. It is a great honor for Grand Rapids to have a President call us home. We all knew this was coming given the highlights in the Press. 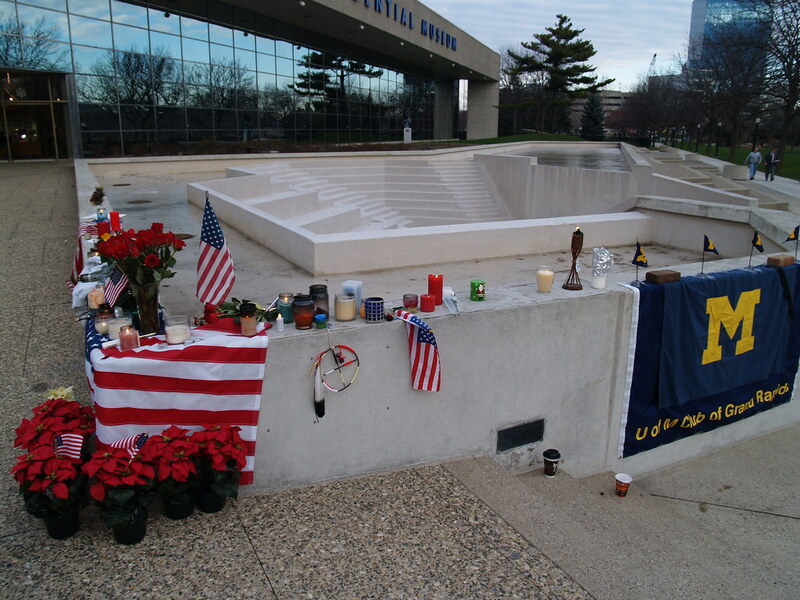 President Ford was undoubtedly a hometown hero and will certainly get a hero's welcome when he comes back home. If any one ever attended that bash he threw for his 90th or so birthday you could see the wear, but a tint of youthfulness-- that was my memory of the President. It just hits you hard when you realize this is life. RIP Mr. Ford. As G3 says, its an honor for us. I guess someone can always find a negative. If you wish to dispute anything that I posted please do so. Otherwise, petty insults are not welcome on this forum and I recommend that you read the rules. Thanks, GRUrbanist, that was said very well. 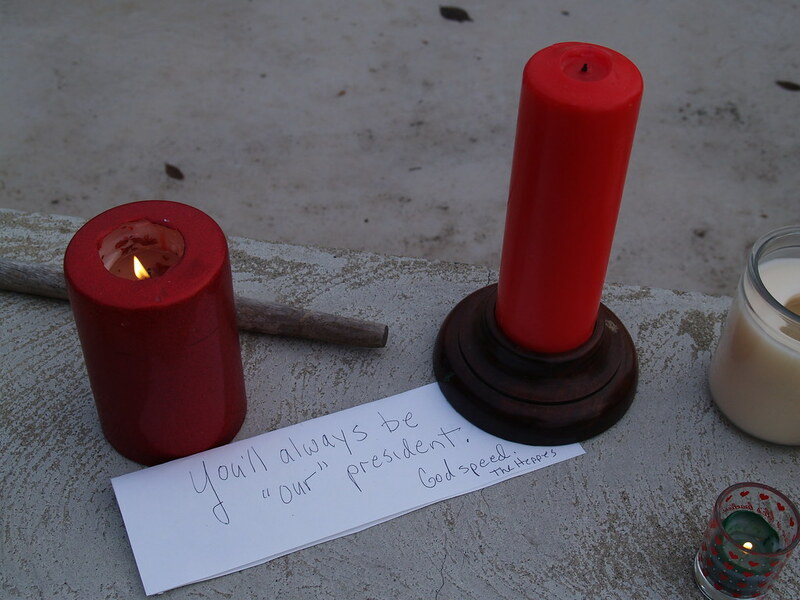 Hopefully, we can can move on and celebrate the life of a president that we as a nation lost today. I was young when he was in office, but being a Grand Rapidian, I too feel a connection to him like many of us did. Seriously, Ford despite what you may think of him, has always been a beloved GR native. He was our congressmen for many years and he never forgot us even when he became president. 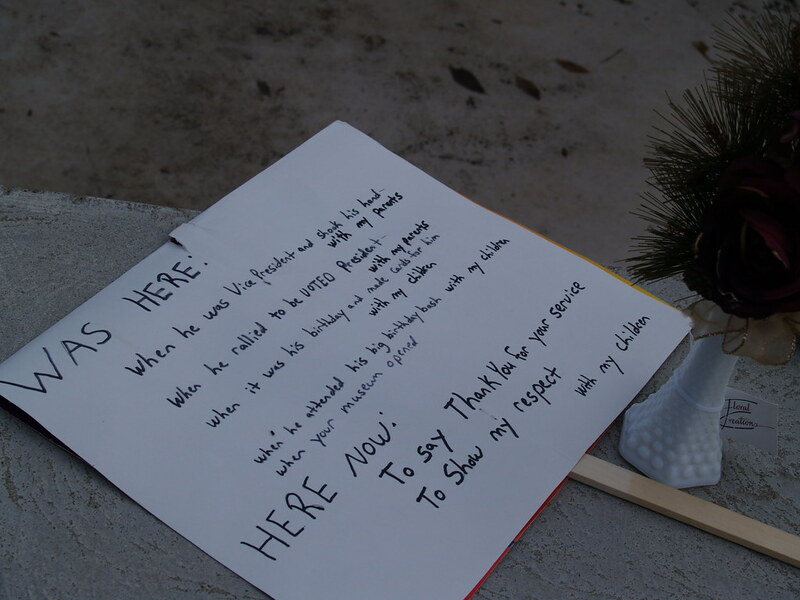 Even though he hasn't lived here in years, we do hold him as a neighbor. If you want a political argument or feel this is a good opportunity to start kicking at him, then just say so. But we, as people that live in GR are going to think the best of him, because he is one of us. In a way I feel that your original post was a "petty insult" to us who honestly feel sadness at his passing. I'll say it again, Gerald Ford was the most awesome President, a healer of our nation and literally among the most honest, most respected men to have held the office of President of the United States. Why do I respect Gerald Ford so much? Not just because he was Grand Rapids' favorite son, but by bravely pardoning Richard Nixon he ended the Watergate debate so the country could move forward. He was a better man, and we are a better country for it. We all knew this day was coming. A sad day indeed. 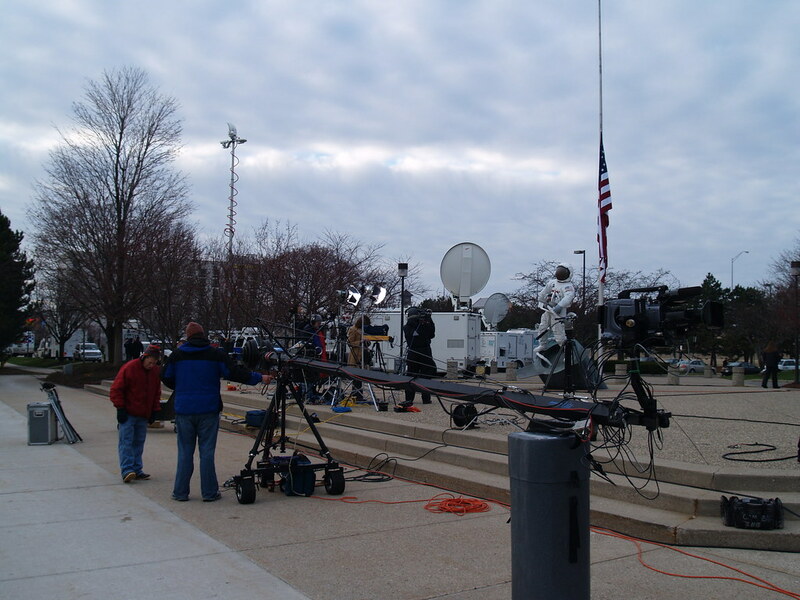 I always pictured his state funeral outside in front of the Museum with the Grand Rapids skyline as the backdrop. I would imagine that with it being winter the funeral will take place inside the Ford Presidential Museum, or at a nearby church? Gerald Ford did a very Grand Rapids-esque gesture by pardoning Nixon. Realizing the whole affair would drag this country through years of trials, and financial draining he did what was probably best for this country, which was to give Nixon a full pardon. 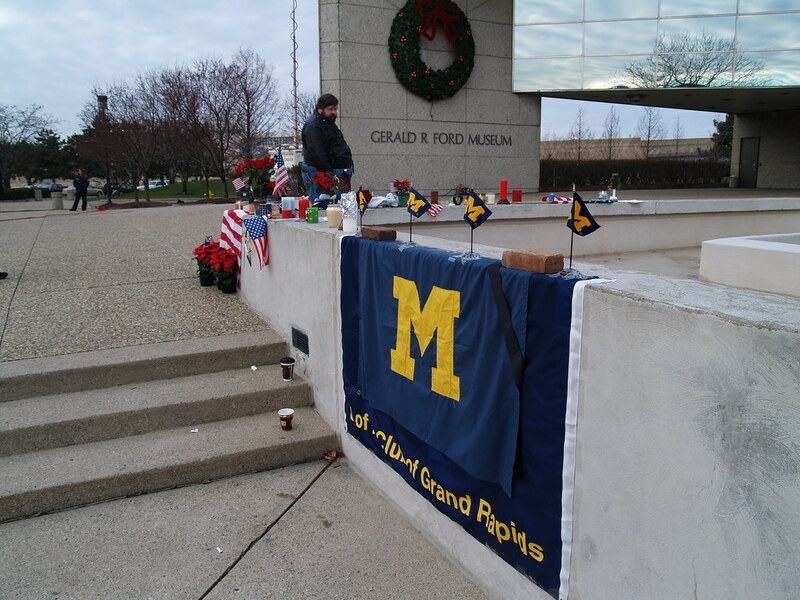 Gerald Ford for me anyways emphasizes the best qualities of the Grand Rapids citizenry, and its officials. Was it politically acceptable? Absolutely not. But you tell me if there is any other Senator, or President today that would fall on his own political sword if it meant healing this nation, and you won't find one. Granted Ford might have made his decision easier because he was looking to retire as a congressman before this all happened, and wasn't really looking for political office at the time. Ford never had aspirations to become President, but when he came to that office I believe he handled it with the dignity and respect due of a public official. Gerald Ford was one of the last of his kind, one of the few remaining Rockefeller-style Republicans. that last one is a cool photo, and I'm surprised no ones gotten one from that angle yet. I understand the rules and all you stated was an opinion. I would think as a forum administrator you would show a little more compassion when a cities favorite son has passed away. I'll make a point to visit your cities forum when your cities most famous resident dies to crap on a thread remembering that NASCAR driver or the guy who figured out how to deep fry pancakes. Ban me if you must, but your original post was un-called for. An interesting look at the travel in for the President when he gets "home."